One of the rumored modifications is the inclusion of a 10-megapixel front-facing camera, according to CompareRaja, citing information from Steve Hemmerstoffer, better known by his @OnLeaks Twitter handle. That would mark a significant jump versus the 7-megapixel camera on the iPhone XS, XS Max, and XR. Apple is also reportedly making improvements to its TrueDepth system, used for Face ID and Animoji. These weren't specified, though the site pointed to analyst Ming-Chi Kuo, who in November indicated that Apple might increase the output of the system's flood illuminator to minimize the impact of ambient infrared light. A previously-mentioned triple-lens rear camera may include 10- and 14-megapixel sensors, but details of the third sensor are unknown. One possibility is that this will support a "time of flight" (TOF) system for depth maps, useful in Portrait shooting and augmented reality. Repositioning of cameras is allegedly forcing Apple to adjust iPhone's internal design, changing to a nearly square-shaped battery and placing the logic board above the battery instead of parallel to it. However, either rumored camera alignment would occupy more internal space than Apple would likely find acceptable. The company is said to be keeping a Lightning port, at least in prototypes. Speculation has suggested that Apple might move to USB-C as it did with 2018 iPad Pros, which would expand accessory compatibility. 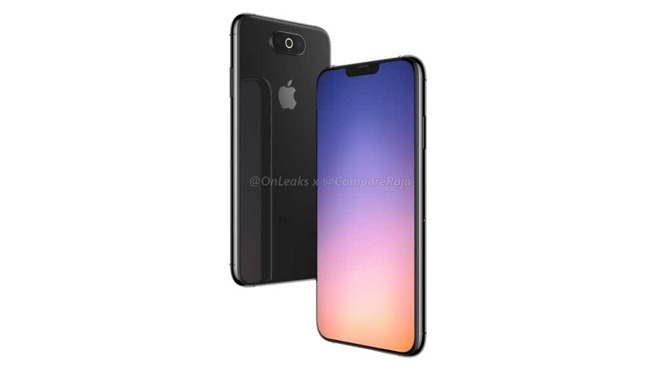 CompareRaja and @OnLeaks recently posted two renders said to represent camera placement on Apple prototypes — one with a square corner module, the other with a centered horizontal alignment. Because Apple is still in engineering validation testing, it's possible that neither layout could be adopted, even if some aspects of the rumors prove authentic. A standard September 2019 launch date is anticipated.